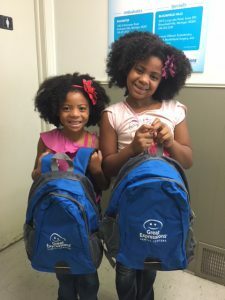 (Sept. 5, 2018) – To support families this back to school season, Great Expressions Dental Centers donated more than 2,000 backpacks featuring school and dental supplies to families in Southeast Michigan. As part of this community-based initiative, Great Expressions teamed up with National Heritage Academies to donate over 1,600 backpacks to students across eight schools in Canton, Livonia, Romulus, Ypsilanti, Pontiac and Waterford. The organization also hosted donation events at six of its offices in Metro Detroit, donating 100 school bags to families at each location. The school bags given to students included notebooks, pencils, folders and other school supplies. Given Great Expressions’ continued commitment to oral health, the school bags were also filled with dental hygiene items to maximize academic achievement and encourage oral health as a vital component to an overall healthy life. On average, families spend up to $600 a year in school supplies, per child. As students attended their back to school orientation and connected with faculty and friends, they also received a visit from a member of the Great Expressions dental team. Great Expressions continues to support families and students through its commitment to providing quality dental healthcare and impactful experiences to the communities the organization serves. To find the Great Expressions office nearest you, visit, www.greatexpressions.com.